I take a break from the caterpillar posts to share a truly incredible moment with you. A friend and I traveled east over the weekend to search for caterpillars for the upcoming museum event I have mentioned in recent posts. Anytime I am down that way, of course, I always hope to observe bears or something else that is hard to find here in the more developed Piedmont. The day started out with driving on dirt roads near my favorite refuge, Pocosin Lakes, looking for caterpillars. Years ago I had learned the ways of caterpillar hunting by car from my friend, Paris Trail. He would drive very slowly down an isolated dirt road looking for chewed leaves in the vegetation along the edges, stopping to check out anything promising. We had good success finding some interesting caterpillars for BugFest on country roads out near Columbia (more on that in another post). We headed back toward Raleigh late in the day and I decided to drive through the refuge in hopes of seeing some bears. We had already had some great non-caterpillar sightings – hundreds of Bobolinks, a bird I don’t see that often, feeding in the fields at another refuge, Alligator River. We had also seen a Black Bear sow with three cubs and the largest King Snake I have ever seen as it crossed a dirt road in front of us. There are miles of gravel roads in the eastern section of Pocosin Lakes National Wildlife Refuge that pass through thousands of acres of seemingly endless shrub thickets, pines, and flooded forests. I have only been through this part of the refuge a couple of times and seen mainly Quail, Wild Turkey, a few deer, and some snakes. But yesterday afternoon I spotted something a few hundred yards down the road walking away from us. I stopped to check it out through binoculars. 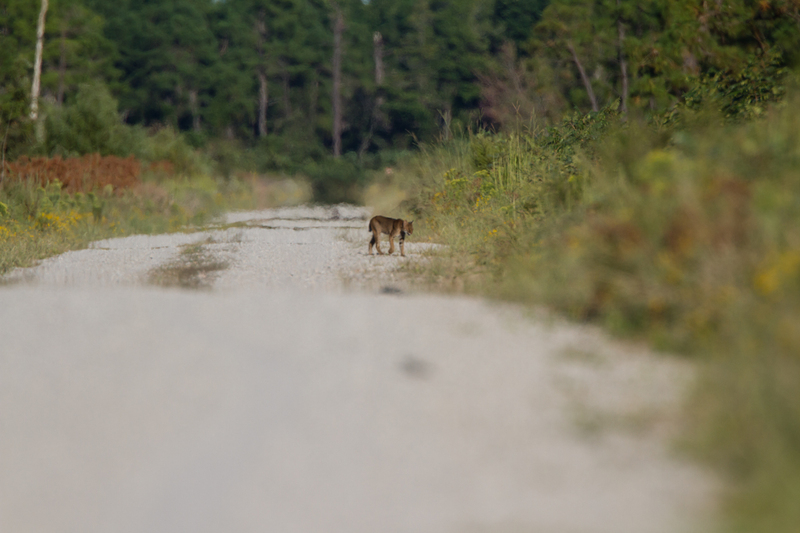 It was tough to tell at first, maybe a Coyote, maybe a Red Wolf, but then it turned and I could see the distant outline had only a short tail – a Bobcat! We watched it for a few minutes as it walked away and then I began to drive towards it at a very slow pace. 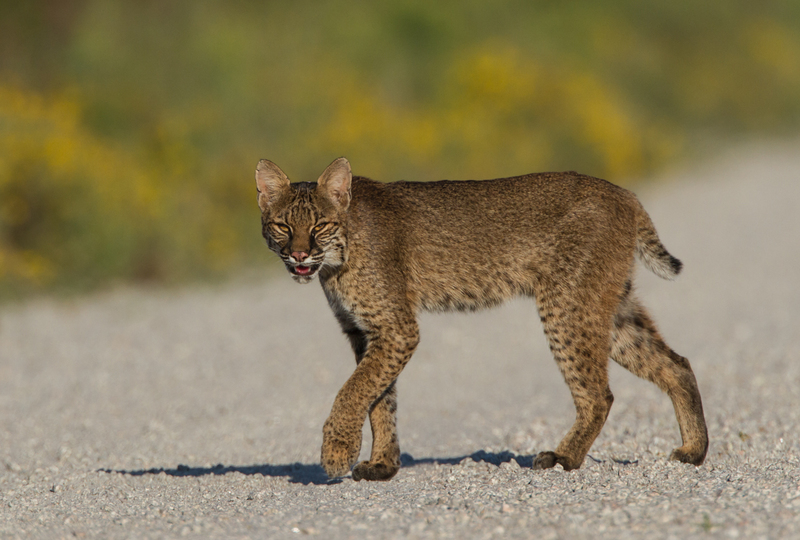 The Bobcat turned, looked our way and resumed walking down the road, eventually wandering off into the vegetation. We sat a few minutes, and then drove slowly past the spot we had last seen it. It was nowhere in sight, although I knew it might just be sitting in some thick vegetation watching us. 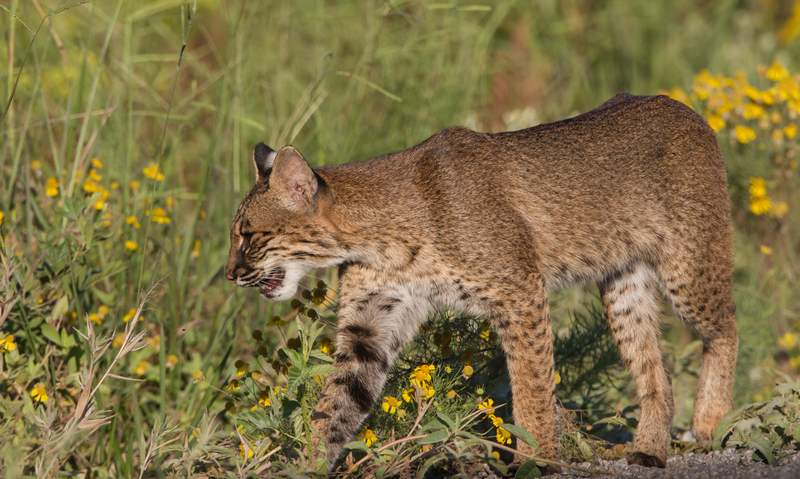 I have been fortunate to see many Bobcats over the years, mainly down east at Alligator River and Pocosin Lakes, along with a few in the mountains, and one much closer to home at Mason Farm in Chapel Hill. I have often seen them just sit and watch, confident in their camouflage and the ability to disappear in an instant if warranted. Down the road was a lone pine tree that cast a dark shadow across an otherwise bright gravel roadway. We drove down and parked in the shadow, figuring it would help hide us, and we got out with our cameras (I had my 500mm lens with a 1.4X teleconverter), sat down behind the car to hide our outlines, and waited. Within a minute or two, the sleek form materialized again. The Bobcat was now a little over 100 yards away but continuing in its original path which meant it was now headed our way. The scene was bathed in late afternoon light as we watched the Bobcat through binoculars. We could only hope it would continue walking down the road. As it did, it occasionally stopped and looked or listened for something in the grasses along the edge before slowly resuming its path toward us. At one point, it stopped, cocked its head, crouched, and then pounced off into the vegetation, disappearing from our view. It stayed hidden for a couple of minutes, and did seem to lick around its mouth as it walked back out, perhaps satisfied with some quick snack – a rodent? a frog?, a small bird?…who knows. 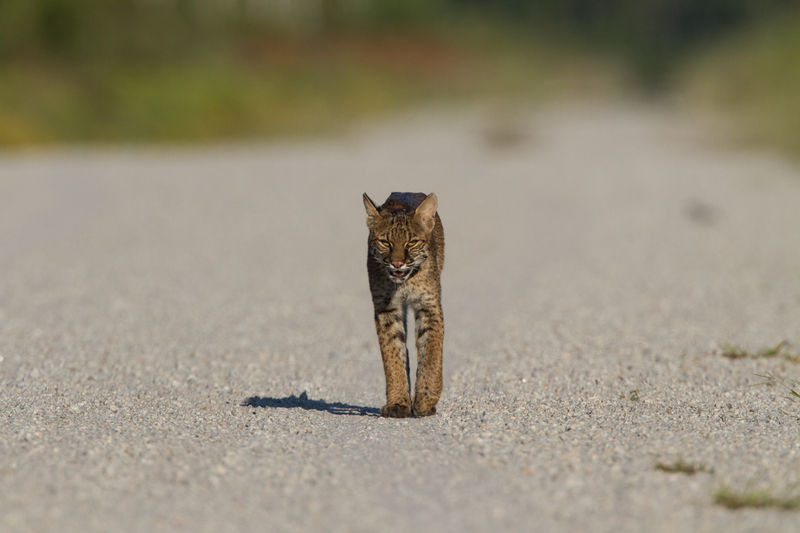 Over the next several minutes, the Bobcat slowly made its way toward us, occasionally looking our way, but mainly checking out who-knows-what along the road edge. We both tried to keep our camera firing to a minimum because at times like these you realize how loud a camera shutter can be. It finally just plopped its hindquarters down in the middle of the road, looked around, and then stared straight at us. We both were holding our breath, admiring this beautiful wild creature that was sharing a part of its day with us. It then slowly stood up and started to walk toward the opposite side of the road. This gave us a glimpse of its supple power, the combination of a gliding walk with a muscular frame. We both commented later on how all felines from house cats to lions have that same smooth, graceful movement. As it continued, it angled back toward us, looking our way and then peering over into the nearby shrubs. 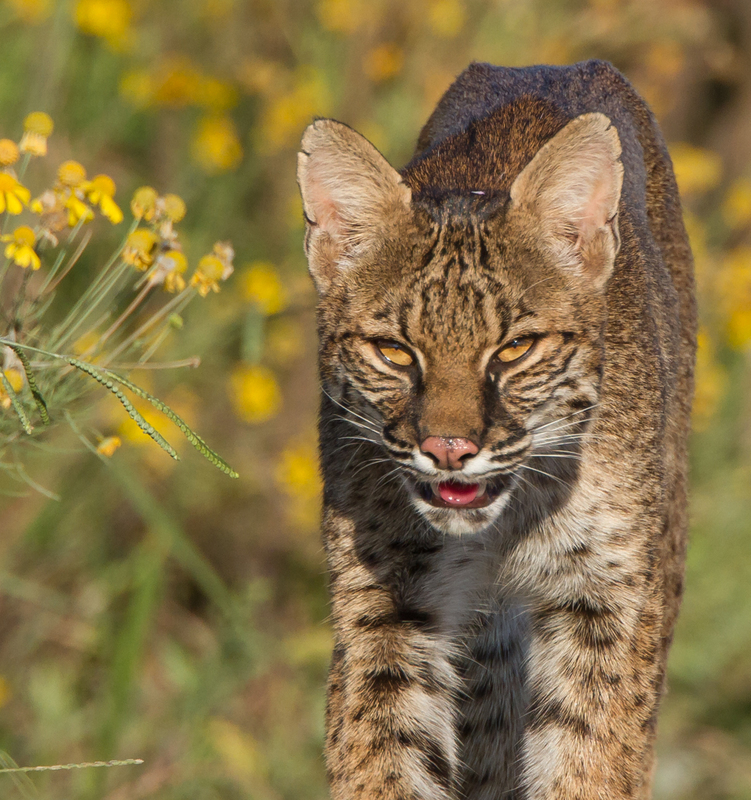 There is something magical about looking into the eyes of another animal, especially one as elusive and majestic as a Bobcat. It is a rare privilege to spend ten minutes or more with a predator, or any wild animal for that matter, observing it as it goes about its life, allowing you to glimpse into its mostly hidden world. And then, it turned and silently vanished into the vegetation. We were speechless. We waited a few minutes, straining to hear a sound or see a movement that might indicate the Bobcat was still nearby. Nothing. We whispered wondering how close it had been when we last saw it. My friend finally paced it off – the Bobcat had been about 100 feet from where we sat. She turned to walk back toward me and the Bobcat slinked off, rustling a few branches as it went, unseen, into the safety of the forest. Neither of us had seen it while it apparently sat and watched us from maybe 30 feet as we walked and talked about the incredible, unforgettable encounter. 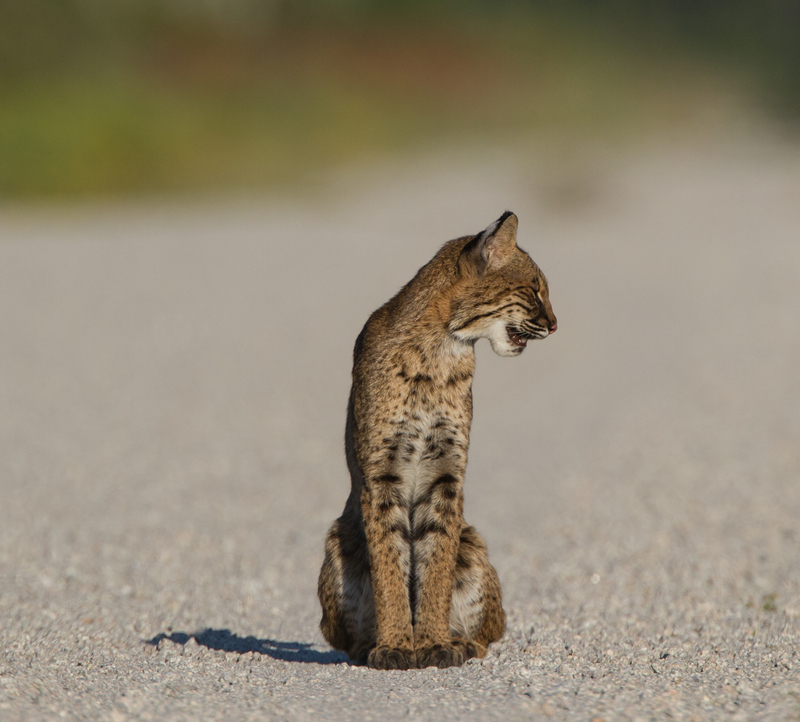 This entry was posted in Natural History, Nature Photography, Trip report and tagged bobcat, pocosin lakes national wildlife refuge by roadsendnaturalist. Bookmark the permalink. Amazing! I LOVE your stories and photography! Thanks, it was an awesome experience. Wauw, what a great moment, what a beautifull cat! 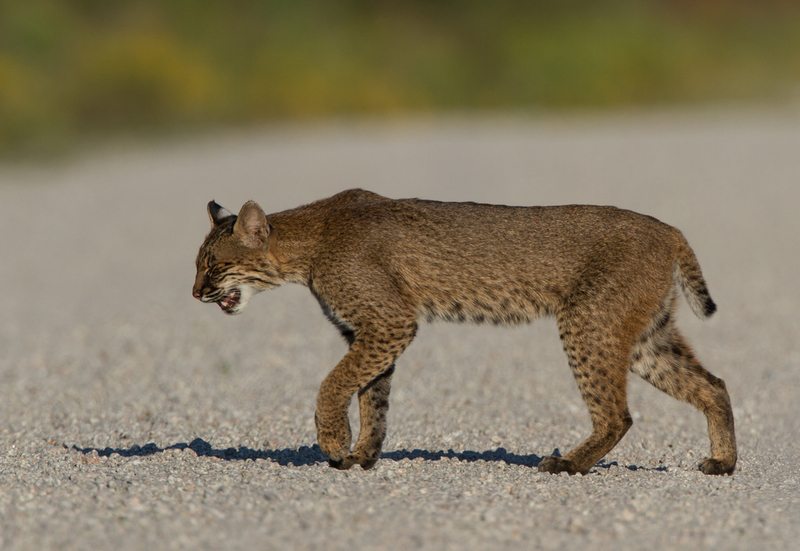 We once have seen a bobcat with three kittens in Rocky mountain NP. It is such a great animal. Wow! 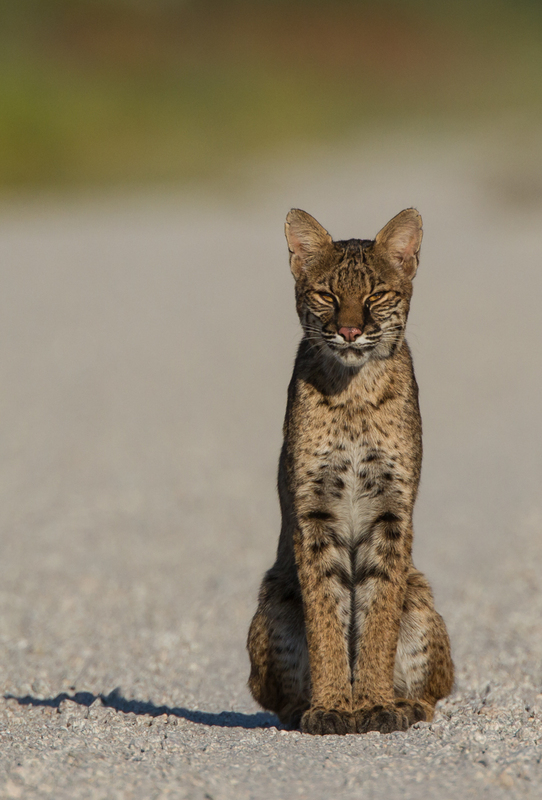 I love the shot of the bobcat sitting and staring right at you– gorgeous. I’m really glad you’ve kept up the blogging!